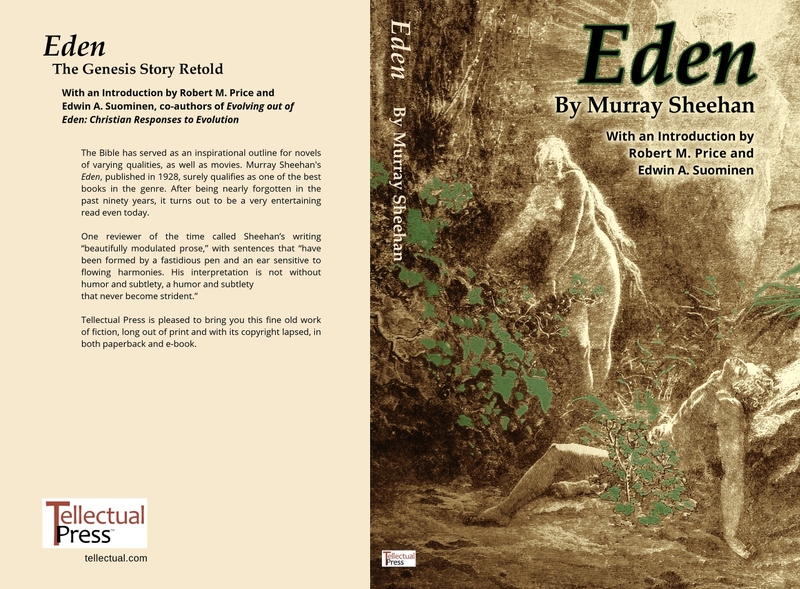 Book review (and promotion): Eden by Murray Sheehan (1928). Reprinted with an Introduction by Robert M. Price and Edwin A. Suominen, Tellectual Press (2015). Last summer I stopped at one of our remaining used bookstores in town and picked up an old hardback “Treasury of Great Bible Fiction.” Most of the stories in it are pretty cheesy, but one of them really impressed me with its beautiful, powerful writing and realistic depiction of the underlying Bible tale. It was an excerpt from a 1928 novel Eden by Murray Sheehan. An Amazon search led me to one of those oddball used & rare booksellers online. Soon I had myself a hardback copy of Eden, almost ninety years old. After reading through its 200 or so yellowed pages, I came away just as impressed with the rest of the book as I’d been with the excerpt. It’s a great retelling of the Genesis human-origins story, wonderfully written and still very engaging to read nearly a century later. This thing deserves to be a treasured classic, I thought. Why isn’t there an ebook version of it, or at least a paperback reprint? To my delight, I found that it has passed into the public domain.1 Eden has been set free, the best work of Bible fiction I’ve come across yet. And now my indie publisher Tellectual Press is making a reprint available, not just as a paperback but also for the Amazon Kindle. The ancient rabbis peering through their treasured scrolls of the Hebrew Bible practiced this literary art, interpreting scripture passages (especially the difficult ones) by retelling them. They provided their own versions, wider in scope, which contained plot details and additional characters and circumstances that they hoped might make more sense of the originals. The biblical original was just the tip of an iceberg to be revealed by their literary sonar. Their results are creative and charming, whether or not they really cast light on the biblical texts that inspired them. And, as shown by Sheehan’s fine novel as well as the release of Bible-themed movies from The Ten Commandments (1956) to Noah (2014), the art of midrash has never died. In Eden, Adam and Lilith have something of a relationship before Eve shows up, but it never gets consummated with anything other than “a wild kiss, the first in all Creation” (Part 1, Ch. 10). God doesn’t like the way things are headed, so He closes Adam’s heart to Lilith and brings Eve into the picture. He provides Adam with a mate who’s less likely to get him into trouble. But He has counted Lilith out too soon. She manipulates Mr. Serpent into tempting Adam and Eve into eating that apple. (Then things go badly, as we all know.) In a clever twist on the Christian interpretation of the story, Sheehan replaces Satan with Lilith. She, not the Hoofed One, becomes the mastermind behind the Serpent’s mischief. Another fascinating bit of midrash in this novel deals with the puzzling vestiges of polytheism that remain in the Genesis creation accounts. Understandably, those are never even noticed by most casual Bible readers. We provide some details in the Introduction, but the bottom line is that this is another biblical contradiction between older and newer texts. The only thing Christian theologians could think of to account for the leftover polytheism was the Christian Trinity. And so, they figured, the Father was conferring with the Son and the Holy Ghost back in Eden. Sheehan follows this tradition, providing some snatches of dialogue between the Persons of the Trinity at a few points throughout his story. He has God shaking His head from His divine vantage point in the skies above, watching Lilith plot Eve’s downfall and muttering about it, consoling Himself with a “second Voice within the Father,” and–via yet another Voice–philosophizing about free will. Sheehan showed a lot of courage in letting his dialogue explore the inevitable implication of a tree-tending Trinity in Genesis: God doesn’t just talk to Himself; He winds up like some poor guy off his meds who carries on a full conversation between separate voices in his head. And since nobody who defends Trinitarianism thinks God is psychotic, the inevitable result is that He is essentially polytheistic anyway! Eden also bravely and cleverly tackles the dilemmas of omniscience and omnipotence vs. the Fall, the oddities of the First Marriage (perhaps the only one with any real claim to being a match made in heaven), and the sibling rivalry between Cain and Abel. And as a parting gift to the reader, he goes the old rabbis one better and answers the oldest of biblical paradoxes as no one has ever thought to do before. It’s a great book, and I hope you enjoy it, too. You can still get original hardbacks of Eden from those oddball online booksellers, for not much more than the $9.99 cover price of Tellectual Press’s paperback reprint. They obviously won’t include the Introduction from which I’ve adapted (in part) this posting, though, or the reprint’s crisp formatting, in both paperback and ebook. (The Kindle version is $6.99.) Plus, you can get the book in both formats for just an additional $0.99 with Amazon’s matchbook feature. Cover image and Introduction are Copyright © 2015 by Tellectual Press, an imprint of Tellectual LLC. Used by permission. You may freely copy the portions adapted here and the cover image, with attribution. The statuary of Adam and Eve is from “one of the gorgeous new carvings around the west door of York Minster,” photographed by Fr. Lawrence Lew, O.P. and CC-NC-ND licensed for free non-commercial use. Since I’m promoting a book that my company is publishing–in search of some modest profit–with this particular post, I asked Fr. Lew for permission to use his photo in it, which he graciously granted. I’m planning to review Arthur and Elena George’s The Mythology of Eden soon. That excellent book deserves its own separate essay. Meanwhile, it’s available on Amazon.com. It’s not cheap, but worthwhile if you’re interested in a fascinating and comprehensive analysis of the Eden story and its authorship.